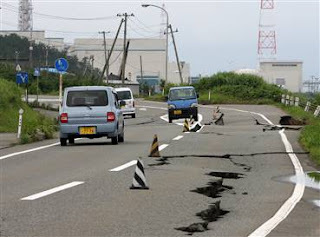 As you may already be aware, on the morning of July 16, 2007, Japan was hit with a massive earthquake that measured 6.8 on the Richter Scale (for reference, it was about the same as the '94 Northridge (LA) earthquake and the '89 San Francisco earthquake). So yeah, it was big. You may remember that I live near the world's largest nuclear powerplant, which is located in the town of Kariwa/Kashiwazaki in Niigata prefecture. Now, if you have been reading the news you may have noticed them referring to a certain "world's largest nuclear powerplant" having some public safety issues, namely spilling radioactive cooling water into the ocean, having 400 barrels of low-grade nuclear waste tip over (the contents of 40 spilled out), or having an oil tank catch on fire. Actually, none of these problems pose much threat to the public's safety, but since the company that owns the reactors have been less than forthcoming with "true" information it makes it a bit difficult to trust them. OK, so, if you were able to put two and two together, you should have figured out that my house lies pretty darn close to the epicenter of this earthquake. To be exact, I think my house is about 18 kilometers from the epicenter. By the way, this is not a good thing. So, now that you have some scope of the situation, I should point out that I am not complaining. In fact, I thank God that I was not home when the earthquake struck. I was in a town about 70 kilometers away and the temblor was reduced to about a 5+ strength there, which was more than enough for me to call it "spooky". I returned home the next morning and had been briefed on what I would see from the vast news coverage, but it was much more devastating when I saw it in person. Let me tell you, 3-d is the technology of the future because if you could see the things I have seen you would all be moved to tears and catch the nearest flight here to help. What makes it all the more difficult is the fact that many of the families that have lost everything (their homes, cars, valuables) have children that are my students. Just imagine that for a second, losing your home. I wouldn't wish it on anyone so when it happens to not one, but dozens of people that you care about, well, to call it heartbreaking just doesn't do it justice. Perhaps the most amazing thing is that somehow these kids still are able to smile and have fun playing with each other to pass the time. The spirit of the Japanese people continues to amaze me and their resilience is astonishing. Anyway, as for the details, I believe there have been 10 deaths reported (mostly from people being crushed by collapsed buildings), 1 person still missing, over 1000 people injured and about 10,000 people homeless. To give you an idea, the population of the Kashiwazaki-Kariwa area is about 100,000. As for me, as expected, most of the stuff in my house that could break broke (dishes, glasses, etc.). My power was restored within 3 days, although water is still a week away and gas may be even longer. There is one thing I am a little conflicted about, but I haven't really been talking about it because it seems so insignificant at this point. My contract ends on July 24th. This was to be my week to say goodbye to a town that has taken me in as their own and treated me better than I could ever have expected. I love this town and I am loved by this town. It is a small, close-knit community and everyone pretty much knows everyone (the population is just 5000). Now, because of the earthquake, I will not be able to say goodbye to this town the way I would like. I want to tell them how much they mean to me, but I know my message will be lost under the weight of the earthquake, and understandably so. I know it is somewhat selfish, but I want these people to know what they mean to me. It is so strange to leave them at this time as I feel like I should stay and help. Guess that brings me to my latest piece of news, which is that I am leaving the best job I have ever had. I am currently looking for a new job here in Japan, but not as an English teacher. I am looking for something in the business world and I didn't know what I was getting myself into when I embarked on my newest journey. Who would have thunk it - that I need to actually speak Japanese to work in Japanese business. Anyway, we will see what happens. I guess that is all for now. Your comments are always appreciated, but maybe now moreso than ever, considering the circumstances. Dean i am so happy that you are ok and dissapointed that i haven't seen any news coverage on this disater in Canada. Sounds like your students have the right attitude to pull them through this time. Good luck with everything. oh dean, your post is making me teary, on an already teary day. i'm glad you're okay. to be honest, it didn't even occur to me that you'd be so close to the danger. I kind of just thought, "oh hey, earthquake." I guess the tiny picture on the globeandmail.com doesn't do it justice. i have no doubt though, that your students, their families, and the society will recover, as humanity often somehow manages to do. best of luck with your job hunt, with your impending separation of something you so dearly adore, and with facing the unknown. email/call/whatever if you need anything. Just came across from photos in Flikcr - about Kashiwazaki - and read your post here. Bit about - your lines about how goodbye might not make much sense in this situation. Well, I'm not there for real so I won't know. But even in English if you really say or write how you feel - how you thank them and how you think this is really odd timing - etc -I believe town's people'd really hear it and would remember that. Thanks for photos - and this blog post. Hey buddy, I was on a missions trip when it all went down and didn't even know about it till I got home a couple days ago...glad to hear you're safe and I'll pray that God guides you through this next phase...have fun with Slats and Marescaux...hit Slats where it counts for me!! hey bro! im just reading your blog now! thank God that you're doing fine and we'll be praying for you brother in dealing with this situation and especially in maybe saying good bye to the people. i'm amazed at what you're doing and you're the right person there right now for those students with your caring, kind & loving attitude. Be strong brother and know that prayers are offered up on your behalf & for families out there! Blessings! Hey Dean, I'm glad you're safe and sound brother. Sorry to hear about what you're going through, praying for ya. Take care, keep your eyes up man.